It was a case of second time lucky for an historic church’s bid for funds to repair its roof. St Peter’s Church Bexhill is set to receive £43,900 from the Listed Places of Worship: Roof Repair Fund. It is one of 51 historic places of worship in the south east to benefit from a share of £2.4m announced today (July 6). “We are absolutely delighted,” said Rector David Reynish. He said much of the credit for the successful application should go to church treasurer Alan Simmons. “He did a lot of the work and they said it was a very commendable application,” said Fr Reynish. “We were really, really pleased with that. Fr Reynish said one person who would be ‘absolutely delighted’ to see the roof repaired would be church warden Cathy Gillman, who has responsibility for the fabric of the building. “We are looking forward to a water-tight winter and a smart tower,” he said. The £2.4m for the south east was part of a wider funding package of £22.9m for 401 historic places of worship. “Churches and cathedrals are a pillar of British life and we are committed to ensuring future generations will be able to admire and use these historic buildings,” said Chancellor George Osborne. 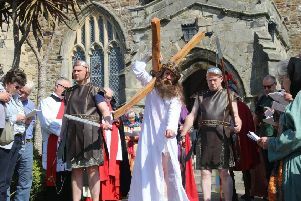 The Church of St Thomas the Martyr, Winchelsea, St Oswald’s Church, Hooe, Trinity Methodist Church, Broad Oak, and St Mary Magdalene Orthodox Church, Hastings, also benefitted form the fund. Fr Reynish said he was delighted to see other churches receiving awards alongside St Peter’s. Nationally, the historic places of worship will receive between £10,000 and £100,000 to meet the costs of urgent repairs to roofs and drainage.